Winemaker’s Notes: Intense cherry-red colour. Aromas of small red fruits and black currants. Very round wine with aromas of red fruits (cherry, raspberry). 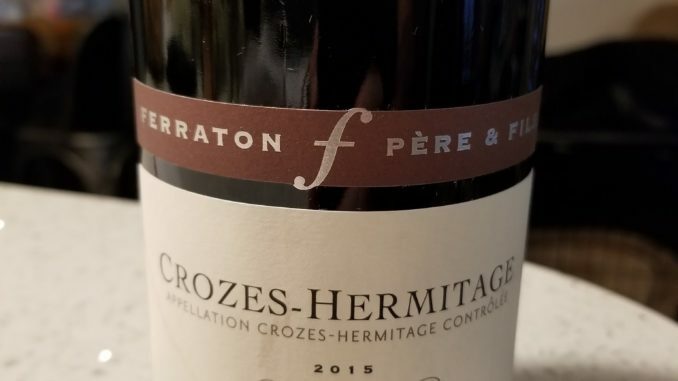 My Review: So a couple weeks ago I reviewed another Ferraton Pere & Fils wine – I liked it well enough, but I didn’t want to pass too much judgement because it was one of two bottles I had received. I have to admit, I liked the La Matiniere better. In the glass the wine was red with purple streaks through it. On the nose I picked up red fruit. In the mouth the wine was dry, with flavors of red fruit carrying over from the nose. The wine showed good, round body at the beginning before leading to a clean finish with very little lingering notes. My wife and I paired the wine with a baked pasta, and the dryness of the wine was a great balance to the sauce of the dish, while complimenting the acid from the tomato sauce. For $14 I really liked this wine, and I would absolutely buy it – it shows well, but for the price it can be your Tuesday-evening sipper without having to sacrifice quality. Well worth a pick-up.